I could use some help figuring this one out. Looked over the changes and don't see anything that would cause this to happen. If you can consistently reproduce that bug (I cannot reproduce it at all), and you can tell for sure it's present in the unified branch, but not in experimental branches (e.g. crop_rec_4k), it might be fixed in the new-dryos-task-hooks branch (most likely changeset 4cf70155104c - with some fixes in that part of the code, but for unrelated issues). @a1ex - not sure if you are replying in general or to dfort. If it's a general reply - I can repeat the test again with dforts 105 firmware updater and his dforts magiclantern-Nightly.2018Apr14.650D105. I'm trying to be a clinicial as possible - empty SD card - drag the ML over - so no prefs set. Then set fps to 24 and then test with only mlv_lite or mlv_rec active. (restart between each test with a blank SD card). I uploaded a new-dryos-task-hooks build for the 650D.105 on my downloads page. If the bug is not there I'll backout commit 4cf70155104c and we'll need to run another test. What I’ve noticed is that if I turn off the auto focus on the lens - its the kit lens - EFS 18-55mm, the camera works fine - no crashing. If I turn on the AF on the side of the lens then I get crashes when recording. I’ve turned the AF-on off and retested a few times - its seems repeatable. Without the AF on the build works okay on the 650.105. This wasn't a problem with 650.104. Built on 2018-04-14 15:57:11 UTC by rosiefort@RosieFoComputer. Repeated the test a couple of times. back to the AF problems again. works fine if AF off. Tried with an EF 50mm and the problems still appear with AF on. Built on 2018-04-16 00:58:46 UTC by rosiefort@RosieFoComputer. Interesting. Don't know what to make of all this information but for now I'm removing all but the new-dryos-task-hooks test builds. Looks like that autofocus bug on the 650D.105 firmware is fixed with the new-dryos-task-hooks changes as a1ex pointed out in this pull request comment. It is also something that is going to be a part of the unified branch so perhaps all of the firmware updates in progress should be tested on the new-dryos-task-hooks branch. Please report back and post any failed tests. Note that when I ran the test it worked best if started in photo mode. The test will tell you when to switch to movie mode. Thanks. I get those on the EOSM too. 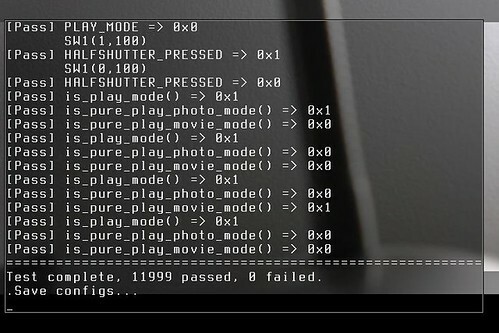 Next test needed for 650D.105 -- using the lua_fix test build on my downloads page, turn on the lua module and run the "Script API Tests." model = "Canon EOS 650D"
name = "EF-S18-55mm f/3.5-5.6 IS II"
Please switch to M mode. Suppose camera should have a target able to be focused ... will retry. Any other requirements? Uh oh, that doesn't look good. Does the focus confirmation work? 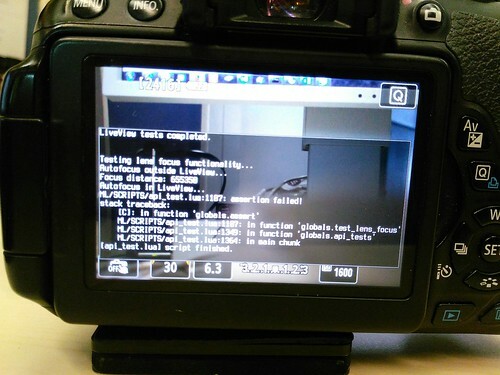 We had a similar issue with the 550D test but I don't think it ended up with an assertion failed error. Did it save an error log? Of course you knows what comes next -- do you get the same error on 1.0.4 using the lua_fix build from the experiments downloads page? These are the tests a1ex is asking for. 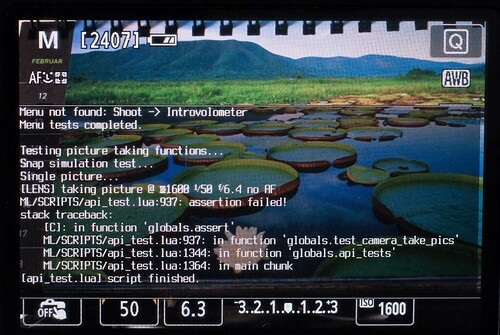 @Walter - looks like you're mentioned in that post about autofocus issues so this is probably not something related to the 1.0.5 firmware update. Looks like you have face tracking turned on. What happens if you choose another autofocus mode? See source. Some strings deliberately spelled wrong for testing purposes. running selftest module: "Stubs API test." I get the following - Test complete, 11781 passed, 1 failed. second time - Test complete, 11780 passed, 2 failed. third time - Test complete, 11781 passed, 1 failed. Test complete, 11781 passed, 1 failed. Thanks--looks pretty good and confirms Walter's findings. Interested in what your lua_fix test reports. Tried latest build found in your repository. No luck. Assertion failure again. @Walter - If you roll back to 650D.104 and run the lua_fix from the experiments download page do you get the same assertion failure? So it looks like whatever the problem is, it doesn't have to do with firmware update. Still, it is something that should be fixed. Are you always testing with the EF-S18-55mm f/3.5-5.6 IS II lens? Have you tried any other lens or even without a lens so it skips those tests?